"Ballyard Brown" was created through a collaborative effort with two professional groundskeepers. Engineered with a high Ballyard Clay content for the greater load bearing and shear strength demands of higher levels of play and enhanced with Stabilizer Water Binding Technology to minimize downtime and reduce maintenance. 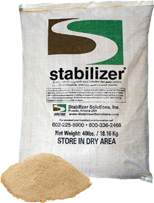 Because of the unique particle size, this mix can be used as an amendment to add clay content, coarse sand content, and Stabilizer to existing infields without creating a layering effect.